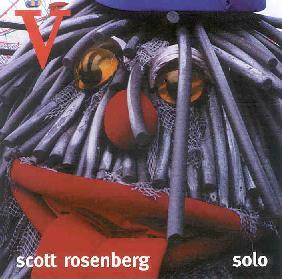 On Solo, Chicago-based saxophone, clarinet, and flute player Scott Rosenberg offers up a series of what seem to be exercises in the possibilities for pure sound construction from these instruments. Scott throws himself physically into the creation of the music, with various breathing, blowing, and voice techniques being key to the resulting parade of sounds. This is fairly abstract stuff, though Rosenberg produces a banquet of intriguing sonic textures that in a larger ensemble setting could make for some interesting music. In fact, several months ago I had the opportunity to see a quartet including trumpet players Axel Dörner and Greg Kelley playing this style of horn improvisations, and I was really taken by the sheer physical requirements and how intensely involved the musicians' bodies were. That is, they weren't just "blowin' their horns". On one track on Solo we hear Rosenberg utilizing his voice with the instrument to the point where he starts coughing. As interesting as solo recordings of this type of improv music may be, it's tough to listen to it all in one sitting, though much more enjoyable an experience in a live setting.